Students - Today's poem is a quiet poem, and it is about the picture you see above, a picture I took just yesterday. On my way into a school yesterday morning, after an 80 minute drive in the rainy dark, I emerged from my car to see these magical leaves, made even more magical by rain and morning sun. While part of me wished to hurry into school, another part of me said, "Stop, Amy. Take a picture of this. You will want to remember this pretty scene, here where you least expected to find one." I could have taken a picture with my mind. I could have stopped to draw the scene. Instead, yesterday, I took a photograph. And here it is. In photo captured then and later, captured with the photo of words. This is a quiet poem because this small still life gave me a quiet feeling inside. So rather than focusing on rhyme-playfuness today, my poem focuses on focus - on looking carefully at one beautiful, surprise life-painting just left there in my busy path. If you have visited The Poem Farm before, you may know that I sometimes push myself to write free verse, unrhymed, poems. This moves me out of my comfortable home in rhyme and bouncy meter. When you look around at the world, not at a screen and not at the busythoughts inside of your head, you will see beauty in many surprising places. Each time I do, I feel tremendously lucky. Today we are all lucky to welcome poet and novelist Irene Latham. 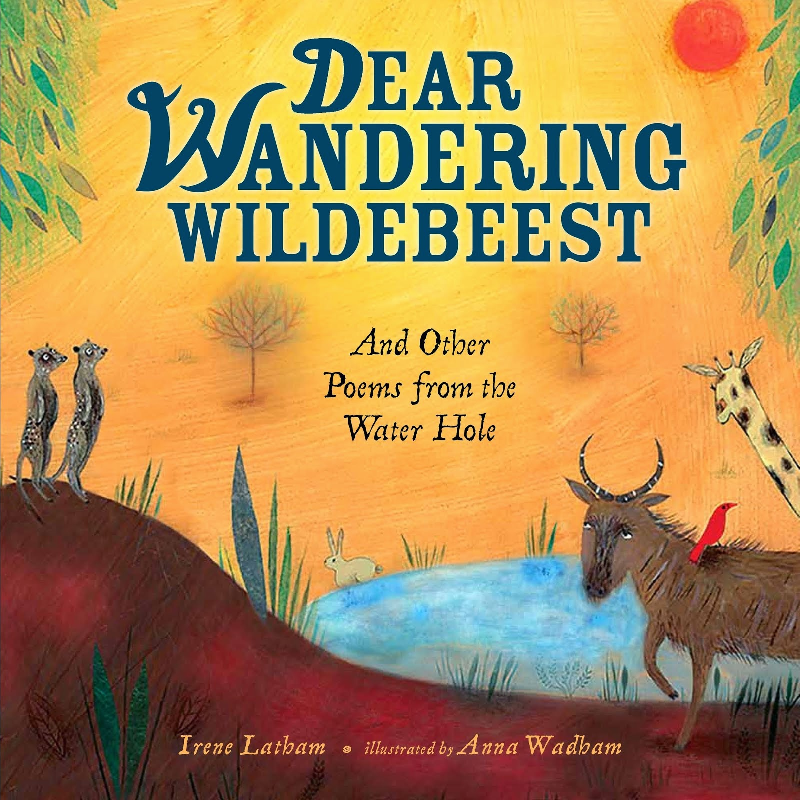 I invited Irene to share about revision and her newest book, DEAR WANDERING WILDEBEEST, a cool, informative, and beautifully written collection of poems about animals from the African grasslands. Thank you, Amy, for inviting me to talk about revision! The Poem Farm is one of my favorite places to visit... so warm and inspiring! Rarely have I written a poem that didn't go through extensive revisions. Simply changing one word in a poem constitutes a new draft... and often it is that one word that I can't imagine until it wakes me up in the middle of the night! I love watching a poem become more clearly what it was meant to be all along. One of the best ways to be able to “see” this is to allow a poem to rest between drafts. Just like bread, a poem needs a chance to breathe after it's been kneaded. Then you can come back to it and bake it to a nice golden-brown in your mind's oven. My name is Black Mamba. They call me Cape Cobra. Seen any weaver birds lately? When I sizzle, you shake. I go by Puff Adder. Step on me, if you dare. See how I tried to include in each couplet a quality unique to that particular kind of snake? That was a good approach, and I wanted to keep it. BUT. I wanted to employ more poetic techniques to really make this poem shine, so I kept at it. If you're reading this, and writing your own poems, be patient with yourself. Remember that we have millions of words to choose from, so endless variations are possible. Keep tinkering – that's where the joy is! And also, rest. You'll know when it's time to stop. I am very grateful to Irene for joining us today here at The Poem Farm and also at Sharing Our Notebooks. 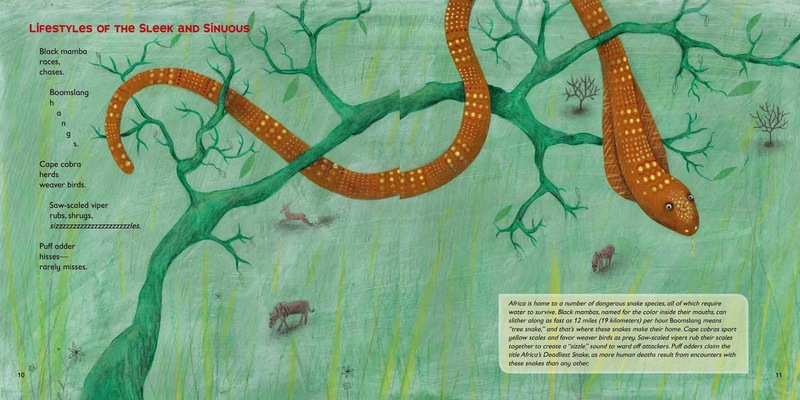 To peek into Irene's notebooks, head over there, peek away, and comment to be entered to win your own copy of DEAR WANDERING WILDEBEEST. Renee is hosting today's Poetry Friday party over at No Water River. All are welcome to join in, visit, share, and love poetry in her joyous space today. Hi, Amy. I can see why those leaves caught your eye. I love poems, like yours, that capture a moment of stillness. How much fun was it to see Irene at work "behind the scenes" of her poem?! Thanks for sharing some of your process, Irene. Thank you, Amy, for the reminder to stop and honor the small, sweet moments in our lives. Wonderful interview with Irene. I especially like the advice: "Just like bread, a poem needs a chance to breathe after it's been kneaded. Then you can come back to it and bake it to a nice golden-brown in your mind's oven." Love your idea of "watercolors" - and thanks to Irene for sharing her revisions to that poem, which made it so much better! SOO much to love here today, Amy! That timeless moment of five randomly laying leaves (there's a haiku in there, too, I think...) which you stopped to appreciate - thanks for sharing. Your poem tells a little story, and captures so much for us who read it, Amy! Those little peeks in a day are wonderful, I think. And Irene, your words are so inspiring about patience in revision. I love your changes, just right to show the essence of each. Much to beware in "Puff Adder/hisses - /rarely misses". Thanks both of you! I LOVE your poem. And I must admit, I am craving some autumn, so it was a real treat for me. Thanks for a wonderful post. 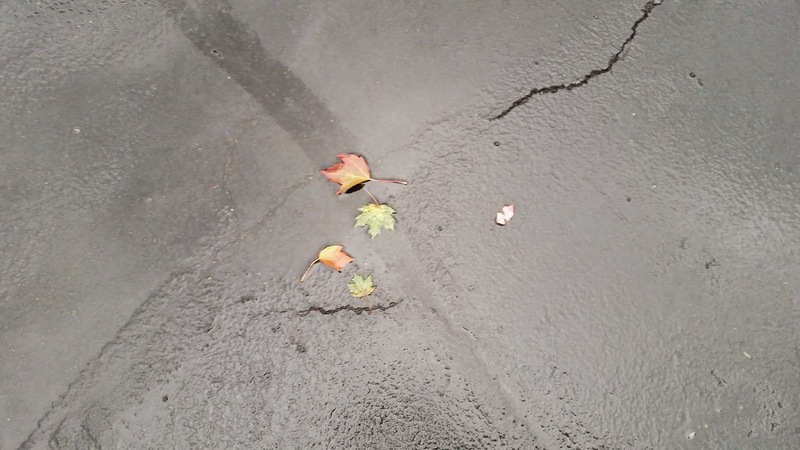 Wonderful post from Irene -- the concrete example from her book brings revision to vivid life! Your poem is a great reminder to keep our eyes open for the abundant beauty in the world. Loved your poem, Amy. And I so enjoyed hearing from Irene about revision. The line "if this poem is the only poem a reader ever reads out of this book, will I be satisfied with that?" is something that applies to all writing...this one poem or this one page or this one sentence. I just love the way she said it. 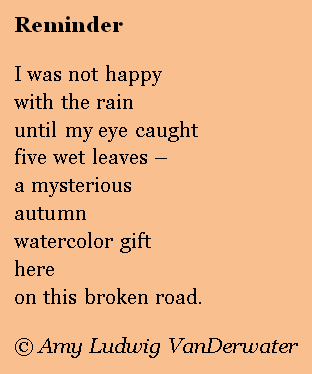 Of course the wet leaves would be a watercolor moment for the wonderful poetic you! I have missed your poems. So glad to be immersed in poetry again. Late to this post, but wanted to let you both know, Amy and Irene, how much I enjoyed and learned from it- from the quiet moments spent with magical leaves to the patience required of revision, to find the perfect reflection of ourselves in our writing.